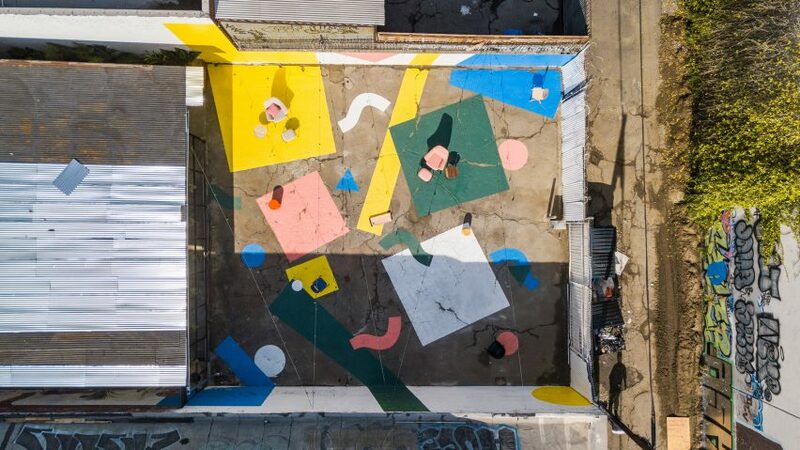 Swedish furniture brand Hem has opened its first permanent US showroom in Los Angeles, featuring a courtyard decorated with colourful graphics that resemble confetti. Hem opened the showroom in Downtown LA in collaboration with US flooring company Madera. The space is Hem's second permanent showroom, after a location Stockholm, and follows a series of pop-ups around the world. At the West Coast hub, Hem enlisted San Francisco­-based designer Clark Thenhaus to create an installation for the outdoor patio. Called Confetti Courtyard, it comprises square, squiggle, triangular and circular shapes typical of the paper confetti thrown at special occasions, but supersized. Painted in hues of yellow, blue, pink and green, the graphics pop against the cracked grey flooring and weathered white-painted walls to create a bright backdrop for programmed events. Thenhaus, who runs Endemic Architecture, also arranged the shapes to mark out particular areas during these activities. "Distributed throughout the courtyard as though they are oversized pieces of confetti, they create a loose organisation with discrete spaces that cues visitors to move and interact in particular, nuanced ways," said a project description. "The super­sized confetti graphics wrap up the walls and fold down onto the floors, implying rooms within the courtyard that sponsor social interactions, encourage active mingling, accommodate varied methods of display for future programming, and frame the courtyard as an immersive, colourful environment." Located at 810 Mateo Street, the Hem x Madera showroom is marked on the outside by pink-painted brick walls. Inside, it features white-painted walls, wooden flooring and exposed wooden ceilings. This creates a setting for Hem's range of furniture, accessories and lighting – all made in collaboration with designers. Details like blue-painted circles on the walls nod to the exterior installation. Among the pieces on show are the splattered metal stools by Max Lamb, the Kumo Modular Sofa by Anderssen & Voll – which won Furniture Design of the Year at the 2018 Dezeen Awards – and Luca Nichetto's modular Alphabet pendant lamp. Founded in Stockholm in 2014, Hem usually opens temporary retail spaces in cities around the world to bolster its online operations. It has recently set sights on the US with pop-ups in New York and Los Angeles, before founder Petrus Palmer expressed ambitions to make a permanent West Coast destination. "We've had our sights set on opening a physical retail space in Los Angeles for some time, as we knew from our online sales that LA was a key market for us, so it was just a matter of finding the right venue," said Palmer at the time. Other Scandinavian brands expanding into the US market including Danish companies Reform, which also partnered with company Madera to open up showroom for its hacked IKEA kitchens in New York, and Hay, which recently opened its first US store in Portland and an e-commerce platform dedicated to the region. Photography is by Lauren Moore, unless stated otherwise. Featured image is by David Salpeter.